Harmonia axyridis (lady beetle) is native to Asia and has been used extensively around the world for biological control of various aphid species. While it is a popular control agent, it has also brought with it several negative effects. Its establishment appears to decrease the diversity of native Coccinellidae. Harmonia axyridis can also quickly become a human nuisance when it seeks shelter during the winter months and takes up residency in the walls and insulation of houses and other structures. Surprisingly, Harmonia axyridis has also attained status as a pest of fruit production; particularly in the vineyards of the Midwestern USA. Harmonia axyridis adults are larger than most of other ladybird species and measure 5-8mm in length and 4-7 mm in width. They are oval in shape and convex. The elytron usually displays a wide transverse \"keel\" at the apex. They are a highly polymorphic with elytra ranging from pale yellow-orange to black bearing 0-19 spots. The head, antennae, and mouthparts are generally straw-yellow and sometimes tinged with black. The pronotum is also straw yellow with markings being five black spots, lateral spots that generally join to form two curved lines, an M-shaped mark, or a solid trapezoid. Larvae have tubercles and spines which are elongate and somewhat flattened. Mature larvae are distinctive in their coloring which is black to dark bluish-gray, with a prominent bright yellow-orange patch extending over the dorso-lateral lobes of abdominal segments 1-5 on each side (Adriaens et al, 2003; Koch, 2003; Soares et al, 2008). Harmonia axyridis is believed to be an effective colonizer and strong competitor because it has a wide trophic niche, a high level of phenotypic plasticity for several of its life-history traits, is a voracious predator, and has strong dispersal capacities that allow it to undertake long range migrations to over-wintering sites (Adriaens et al, 2003). Harmonia axyridis undergoes a holometabolous life cycle going through the egg, four larval instars, pupal, and adult stages. Studies show that temperature has an effect on the adult weight and the rate of development of the stages. The diet of the beetle is also known to have an effect on larval development (Koch, 2003). It has been demonstrated that at 26º C on a diet of the pea aphid Acyrthosiphon pisum, the mean duration of each stage of H axyridis is as follows: egg 2.8 days, first instar 2.5 days, second instar 1.5 days, third instar 1.8 days, fourth instar 4.4 days, pupa 4.5 days (LaMana and Miller, 1998). Adults typically live for one to three months, but may live up to three years (Koch, 2003). Harmonia axyridis is widely used as a biocontrol agent for reducing pest aphid populations in greenhouses, orchards, and gardens in North America since 1916 and in Western Europe since 1982 (Adriaens et al, 2003; Brown et al, 2008a; Koch, 2003). In several cases, this coccinellid has proven to be an effective biocontrol agent, particularly in pecans groves in southern United States (Koch & Galvan, 2008). Harmonia axyridis is known to colonize a wide range of habitats. They are found in cropping areas, meadows, and semi-natural areas (Branquart, 2004). In North America they are found on a variety of nursery, ornamental, and field crops, including cotoneaster, rose, Christmas trees, apple, pecan, alfalfa, wheat, cotton, tobacco, and small grains (Cornell University, 2004). In Belgium H. axyridis was most commonly found on nettle (Urtica dioica L.) and deciduous such as maple (Acer sp. ), willow (Salix sp. ), lime (Tilia sp. ), oak (Quercus sp.) and birch (Betula sp.) but the number of observations was also high on pine tree (Pinus sp. ), hawthorn (Crataegus sp. ), and on a number of herbs such as reed Phragmites australis (Adriaens et al, 2008). They tend to overwinter in buildings where they aggregate in secluded dark places (Branquart, 2004). Its lower limiting temperature has been found to be a round 10°C (Putsma et al, 2008). Harmonia axyridis may produce up to 1,642 to 3,819 eggs per female over their entire life span, at a rate of about 25 eggs per day. Eggs are typically laid in clusters of 20 to 30 eggs (Koch, 2003; Roy & Roy, 2008). Harmonia axyridis preys mostly on tree-dwelling hemipteran insects such as aphids, psyllids, and scale insects. It also feeds on immature stages of other Coleoptera and Lepidoptera and plant material such as pollen and injured fruits (Koch, 2003). The argument has been made that the current populations of H. axyridis in North America may have stemmed from accidental sea-port introductions (Koch, 2003). Principal source: Koch, Robert L.; Galvan, Tederson L., 2008. Bad side of a good beetle: the North American experience with Harmonia axyridis BioControl (Dordrecht). 53(1). FEB 2008. 23-35. Adriaens, Tim; Gomez, Gilles San Martin y; Maes, Dirk, 2008. Invasion history, habitat preferences and phenology of the invasive ladybird Harmonia axyridis in Belgium. BioControl (Dordrecht). 53(1). FEB 2008. 69-88. Kenis, Marc; Roy, Helen E.; Zindel, Renate; Majerus, Michael E. N., 2008. Current and potential management strategies against Harmonia axyridis BioControl (Dordrecht). 53(1). FEB 2008. 235-252. Recommended citation: Global Invasive Species Database (2019) Species profile: Harmonia axyridis. Downloaded from http://www.iucngisd.org/gisd/species.php?sc=668 on 22-04-2019. Harmonia axyridis preys on and displaces native coccinellids, is a pest to fruit production, and is a household nuisance capable of major infestations. It has strong dispersal capabilities that allow it to rapidly colonize new locations. Expansion rates have been estimated at around 50 to over 100 km/yr (Brown et al, 2008b; Van Lenteren et al, 2008). H. axyridis has become a problematic invasive in many parts of North America, South American, and Europe. Intraguild predation by H. axyridis, as well as competition, dramatically reduce native coccinellid populations throughout its introduced range (Adriens et al, 2008; Alyokhin & Sewell, 2004; Foley et al, 2009; Hautier et al, 2008; Koch, 2003; Koch & Galvan, 2008; Noia et al, 2008; Ware & Majerus, 2008). The intensity of intraguild predation appears to be inversely related to aphid prey availability (Burgio et al, 2002). It has reduced native ladybird populations and become the dominant aphidophagus species in many parts of the United States, Canada, and Europe (Adriaens et al, 2008; Gardiner et al, 2009; Harmon et al, 2007; Kenis et al, 2008). Impacted species include Adalia bipunctata, Adalia decempunctata, Coccinella transversoguttata, Hippodamia tredecimpunctata, Coccinella septempunctata, and Propylea quatordecimpunctata Aphis monardae, Monarda fistulosa, Aphis asclepiadis, Asclepias syriaca (Adriaens et al, 2008; Alyokhin & Sewell, 2004; Koch & Galvan, 2008). It exhibits a high tolerance for the species-specific alkaloid defenses found in coccinellids and preys on native ladybird eggs and larvae while at the same time the defensive chemistry found in its eggs allows them to avoid intraguild predation (Sloggett & Davis, 2010; Pell et al, 2008). 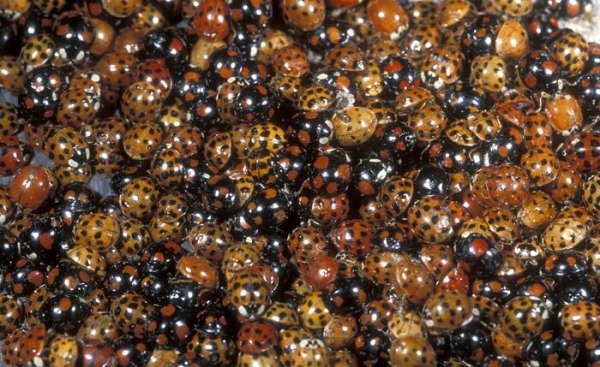 Similar alkenes to those that provide defense for its eggs are deposited within its larval tracks and act as oviposition deterring semiochemicals to other ladybirds (Pell et al, 2008). Additionally, it predates on and reduces aphid populations thereby directly competing with native aphidophagus species (Alyokhin & Sewell, 2004; Hautier et al, 2008; Kenis et al, 2008). H. axyridis may also impact and prey on other species such the monarch butterfly (Danaus plexippus) and chrysomelid Galerucella calmariensis (Koch et al, 2003; Sebolt & Landis, 2004 in Koch & Galvan, 2008). H. axyridis is a significant pest to fruit production and processing. It is a contaminant and cause of damage to wine grapes. It inhabits wine grape orchards and damages and consumes the sugar rich grapes. H. axyridis is harvested along with the grapes and contaminates them by releasing hemolymph when disturbed or killed which causes an unpleasant odor and taste in the resultant wine (EPPO, 2009; Foley et al, 2009; Galvan et al, 2006; Roy & Roy, 2008). Economic consequences are included as a result of losses on the contaminated wine and/or additional costs of time and labor to control its populations (Galvan et al, 2006). Studies have found H. axyridis problematic to wineries in Switzerland and the Great Lakes and eastern regions of the United States (EPPO, 2009; Galvan et al, 2006). It establishment in other major winery regions in Western Europe, South Africa, and California pose a significant threat to the industry (Galvan et al, 2006). H. axyridis is also reported to be a pest to apple, pear, raspberry, citrus, and potato agriculture (EPPO, 2009; Koch & Galvan, 2008; Roy & Roy, 2008). Finally, H. axyridis is a nuisance that infests homes and other buildings in large numbers searching for overwintering sites (EPPO, 2009; Foley et al, 2009; Koch & Galvan, 2008). High densities, as many as thousands in a single home, aggregate inside buildings and cause cosmetic damage, and sometimes bite or cause allergic reactions (Kenis et al, 2009; Koch & Galvan et al, 2008; Roy & Wajnberg, 2008). Their hemolymph has a foul odor and may stain or cause damage to carpets, curtains, furniture, and walls. They may also act as a contaminant pest to food service, industry, and research institutions (Koch & Galvan, 2008). Some studies state that it has become an important seasonal allergen in the United States indicating that it can cause symptoms including chronic cough, conjunctivitis, and even asthma (Foley et al, 2009; Koch & Galvan et al, 2008; Pervez & Omkar, 2006). Physical: Household infestation by Harmonia axyridis may be prevented by sealing or screening entrance points such as window seams, weather stripping, cracks and small holes, exhaust vents, etc. The use of a broom or vacuum is recommended to remove large aggregations from homes. Various traps, including black light and other light traps specifically for capturing beetles are also available (Kenis et al, 2008; Koch & Hutchison, 2003a). Chemical: Traps utilizing pheromone and semiochemical lures are being investigated (Kenis et al, 2008). Exterior application of insecticides focused around windows, doors, foundations, and eves may be prevent infestation by H axyridis (Koch, 2003; Koch & Hutchison, 2003b). Most insecticides commonly used in agricultural environments are toxic to H. axyridis (Kenis et al, 2008). DEET (N,N-diethyl-3-methylbenzamide) and repellents camphor and menthol have also been found to be effective (Koch & Galvan, 2008). Insecticide treatment of H. axyridis in vineyards should not be done preventively but an integrated pest management program should be based on the timing of infestation, estimated levels of infestation and resulting taint, and control methods. H. axyridis adults begin to move to grape clusters between 2 and 3 weeks prior to harvest. Even though fluctuate during the growing season, grape growers should not act until 2 or 3 weeks before harvest when the proportion of injured berries increases, which then attracts and provides opportunity for H. axyridis to feed on the grapes. Grape growers can follow H. axyridis population fluctuation in vineyards using yellow sticky traps, which can be used as an early warning. Control measures to manage H. axyridis before it can become a wine contaminant are essential for reducing the economic impact of this pest on the wine industry. In field and laboratory studies, carbaryl, bifenthrin, zeta-cypermethrin, thiamethoxam, and imidacloprid showed either toxic and/or repellent effects. However, of these insecticides, only carbaryl, thiamethoxam and imidacloprid are currently labeled in the United States for use on wine grapes within 7 days of harvest, which is when H. axyridis typically reaches high densities (Koch & Galvan, 2008). Some discourage against the use of insecticides in vineyards and orchards because of their effect on native aphidophages and beneficial insects (Roy & Roy, 2008). Biological control:Several parasitoids attack H. attack including phorids Phalacrotophora philaxyridis and other Phalacrotophora spp., tachinids Degeria lutuosa and Stronygaster trianulifera, and braconid Dinocampus coccinellae but have not been investigated as potential biological controls (Koch, 2003). The entomopathogenic fungus Beauveria bassiana infects H. axyridis and has been found to reduce egg production and cause winter mortality in studies and may hold potential as a biological control (Roy et al, 2008b; Steenberg & Harding, 2009). Informations on Harmonia axyridis has been recorded for the following locations. Click on the name for additional informations. Bahlai, C. A.; Welsman, J. A.; Macleod, E. C.; Schaafsma, A. V.; Hallett, R. H.; Sears, M. K., 2008. Role of visual and olfactory cues from agricultural hedgerows in the orientation behavior of multicolored Asian lady beetle (Coleoptera : Coccinellidae) Environmental Entomology. 37(4). AUG 2008. 973-979. Bazzocchi, G. G., A. Lanzoni, G. Accinelli, and G. Burgio. 2004. Overwintering, phenology and fecundity of Harmonia axyridis in comparison with native coccinellid species in Italy.Biocontrol (Dordrecht). 49(3): 245-260. Berthiaume, R., C. Hebert, and E. Bauce. 2003. Impact of temperature and duration of cold exposure on adult survival of the Asian ladybird beetle, Harmonia axyridis (Pallas). Phytoprotection. 84(2):85-91. Brown, M. W. 2003. Intraguild responses of aphid predators on apple to the invasion of an exotic species, Harmonia axyridis. Biocontrol (Dordrecht). 48(2):141-153. Brown, M. W. 2004. Role of aphid predator guild in controlling spirea aphid populations on apple in West Virginia, USA. Biological-Control29(2): 189-198. Brown, Peter Michael James; Roy, Helen E.; Rothery, Peter; Roy, David B.; Ware, Remy L.; Majerus, Michael E. N., 2008b. Harmonia axyridis in Great Britain: analysis of the spread and distribution of a non-native coccinellid. BioControl (Dordrecht). 53(1). FEB 2008. 55-67. Brown P. M. J; Adriaens T; Bathon H; Cuppen J; Goldarazena; H�gg T; Kenis M; Klausnitzer B. E. M; Kov�r I; Loomans A. J. M; Majerus M. E. N; Nedved O; Pedersen J; Rabitsch W; Roy H. E; Ternois V; Zakharov I. A; Roy D. B., 2008a. Harmonia axyridis in Europe: spread and distribution of a non-native coccinellid. BioControl 53(1), 5-21. Brown, P. M. J., Thomas, C., Lombaert, E., Jeffries, D. L., Estoup, A. and Lawson Handley, L.-J. 2011. The global spread of Harmonia axyridis: distribution, dispersal and routes of invasion. Biocontrol 56(4): 623-642. Carton, B., Smagghe, G., and L. Tirry. 2003. Toxicity of two ecdysone agonists, halofenozide and methoxyfenozide, against the multicoloured Asian lady beetle Harmonia axyridis (Col., Coccinellidae). Journal of Applied Entomology. 127(4):240-242. Cornell University. 2004. Harmonia axyridis (Coleoptera: Coccinellidae). Biological Control: A Guide to Natural Enemies in North America. Galvan, T. L.; Burkness, E. C.; Koch, R. L.; Hutchison, W. D., 2009. Multicolored Asian Lady Beetle (Coleoptera: Coccinellidae) Activity and Wine Grape Phenology: Implications for Pest Management. Environmental Entomology. 38(6). DEC 2009. 1563-1574. Gardiner, M. M.; Landis, D. A.; Gratton, C.; Schmidt, N.; O Neal, M.; Mueller, E.; Chacon, J.; Heimpel, G. E.; DiFonzo, C. D., 2009. Landscape composition influences patterns of native and exotic lady beetle abundance. Diversity & Distributions. 15(4). JUL 2009. 554-564. Jones, C. S., and J. Boggs. UNDATED. Multicolored Asian Lady Beetle. Ohio State University Extension Fact Sheet: Entomology HSE-1030-01. Koch, R.L., 2003. The multicoloured Asian lady beetle, Harmonia axyridis: a review of its biology, uses in biological control and non target impacts. Journal of Insect Science: 3:32. Koch, R.L and W.D. Hutchison, 2003a. Multicoloured Asian Lady Beetle. Koch, R. L., and W. D. Hutchison, 2003b. Phenology and blacklight trapping of the multicolored Asian Lady Beetle (Coleoptera: Coccinellidae) in a Minnesota Agricultural Landscape. Journal of Entomological Science. 38(3):477-480. Koch, R. L.; Carrillo, M. A.; Venette, R. C.; Cannon, C. A.; Hutchison, W. D., 2004. Cold hardiness of the multicolored Asian lady beetle (Coleoptera: Coccinellidae. Environmental Entomology. 33(4). August 2004. 815-822. Krafsur, Elliot S.; Obrycki, John J.; Harwood, James D., 2005. Comparative genetic studies of native and introduced Coccinellidae in North America. European Journal of Entomology. 102(3). AUG 15 2005. 469-474. Labrie, G.; Coderre, D.; Lucas, E., 2008. Overwintering strategy of multicolored Asian lady beetle (Coleoptera : Coccinellidae): Cold-free space as a factor of invasive success. Annals of the Entomological Society of America. 101(5). SEP 2008. 860-866. Labrie, Genevieve; Lucas, Eric; Coderre, Daniel, 2006. Can developmental and behavioral characteristics of the multicolored Asian lady beetle Harmonia axyridis explain its invasive success? Biological Invasions. 8(4). JUN 2006. 743-754. LaMana, M. L., and J. C. Miller. 1998. Temperature-dependent development in an Oregon population of Harmonia axyridis (Coleoptera: Coccinellidae). Environmental-Entomology. 27(4): 1001-1005. Mabbott, P. 2004. Harmonia axyridis (Pallas). Majerus, Michael; Strawson, Vicky; Roy, Helen, 2006. The potential impacts of the arrival of the harlequin ladybird, Harmonia axyridis (Pallas) (Coleoptera : Coccinellidae), in Britain. Ecological Entomology. 31(3). JUN 2006. 207-215. Mannix, L. UNDATED. Harmonia axyridis, a new biological control�or new insect pest? Colorado State University. Michaud, J. P. 2002. Invasion of the Florida citrus ecosystem by Harmonia axyridis (Coleoptera: Coccinellidae) and asymmetric competition with a native species, Cycloneda sanguinea. Environmental Entomology. 31(5):827-835. Pell, Judith K.; Baverstock, Jason; Roy, Helen E.; Ware, Remy L.; Majerus, Michael E. N., 2008. Intraguild predation involving Harmonia axyridis: a review of current knowledge and future perspectives. BioControl (Dordrecht). 53(1). FEB 2008. 147-168. Pervez, Ahmad; Omkar, 2006. Ecology and biological control application of multicoloured Asian ladybird, Harmonia axyridis: A review. Biocontrol Science & Technology. 16(2). 2006. 111-128. Poutsma, J.; Loomans, A. J. M.; Aukema, B.; Heijerman, T., 2008. Predicting the potential geographical distribution of the harlequin ladybird, Harmonia axyridis, using the CLIMEX model BioControl (Dordrecht). 53(1). FEB 2008. 103-125. Pree, D. J.; Pogoda, M. K.; Bittner, L. A.; Walker, G. M., 2004. Control of the multicoloured Asian lady beetle, Harmonia axyridis (Pallas) (Coleoptera : Coccinellidae) on grapes in Ontario. Journal of the Entomological Society of Ontario. 135 2004. 119-123. Riddick, E. W.; Cottrell, T. E.; Kidd, K. A., 2009. Natural enemies of the Coccinellidae: Parasites, pathogens, and parasitoids. Biological Control. 51(2, Sp. Iss. SI). NOV 2009. 306-312. Roy, Helen Elizabeth; Brown, Peter M. J.; Rothery, Peter; Ware, Remy L.; Majerus, Michael E. N., 2008. Interactions between the fungal pathogen Beauveria bassiana and three species of coccinellid: Harmonia axyridis, Coccinella septempunctata and Adalia bipunctata. BioControl (Dordrecht). 53(1). FEB 2008. 265-276. Schaefer, P. W. 2003. Winter aggregation of Harmonia axyridis (Coleoptera: coccinellidae) in a concrete observation tower. Entomological News. 114(1):23-28. Soares, Antonio Onofre; Borges, Isabel; Borges, Paulo A. V.; Labrie, Genevieve; Lucas, Eric, 2008. Harmonia axyridis: What will stop the invader? BioControl (Dordrecht). 53(1). FEB 2008. 127-145. Van Lenteren, J.C.; Babendreier, D.; Bigler, F.; Burgio, G.; Hokkanen, H.M.T. ; Kuske, S.; Loomans, A.J.M. ; Menzler-Hokkanene, I.; Van Rijn, P.C.J. ; Thomas, M.B. ; Tommasini, M.G. ; Zeng, Q.Q., 2003. Environmental risk assessment of exotic natural enemies used in inundative biological control. BioControl 48, 3-38.
van Lenteren, Joop C.; Loomans, Antoon J. M.; Babendreier, Dirk; Bigler, Franz., 2008. Harmonia axyridis: an environmental risk assessment for Northwest Europe. BioControl (Dordrecht). 53(1). FEB 2008. 37-54. Youn, Y. N., M. J. Seo, J. G. Shin, C. Jang, and Y. M. Yu. 2003. Toxicity of greenhouse pesticides to multicolored Asian lady beetles, Harmonia axyridis (Coleoptera: Coccinellidae). Biological Control. 28(2):164-170. Zenyoji, Satohiko, 2008. Prediction of the time of flight for aggregation of Harmonia axyridis (Coleoptera Coccinellidae) in late autumn based on the concept of accumulation of exposure to low temperature. Japanese Journal of Entomology (New Series). 11(4). DEC 25 2008. 159-167. Alyokhin, A. & Sewell, G., 2004. Changes in a lady beetle community following the establishment of three alien species. Biological Invasions 6: 463-471. Bar�evskis A. 2009. Multicoloured Asian lady beetle (Harmonia axyridis (Pallas, 1773)) (Coleoptera: Coccinellidae) for the first time in the fauna of Latvia. Baltic J. Coleopterol., 9 (2): 135 � 138. Berkvens, Nick; Bonte, Jochem; Berkvens, Dirk; Deforce, Koen; Tirry, Luc; De Clercq, Patrick., 2008. Pollen as an alternative food for Harmonia axyridis BioControl (Dordrecht). 53(1). FEB 2008. 201-210. Braune, Annelie; Gruppe, Axel; Gerstmeier, Roland., 2008. Harmonia axyridis (PALLAS, 1773) in the city region Munchen (Coleoptera : Coccinellidae). Nachrichtenblatt der Bayerischen Entomologen. 57(1-2). FEB 15 2008. 17-21. Burgio, Giovanni; Santi, Fabrizio; Lanzoni, Alberto; Masetti, Antonio; De Luigi, Valentino; Melandri, Massimiliano; Reggiani, Alberto ; Ricci, Carlo; Loomans, Antoon J. M.; Maini, Stefano, 2008. Harmonia axyridis recordings in northern Italy. Bulletin of Insectology. 61(2). DEC 2008. 361-364. Carrillo, M. A.; Koch, R. L.; Venette, R. C.; Cannon, C. A.; Hutchison, W. D., 2004. Response of the multicolored Asian lady beetle (Coleoptera: Coccinellidae) to low temperatures: Implications for winter survival. American Entomologist. 50(3). Autumn 2004. 157-158. Cottrell, Ted E., 2007. Predation by adult and larval lady beetles (Coleoptera : Coccinellidae) on initial contact with lady beetle eggs. Environmental Entomology. 36(2). APR 2007. 390-401. Coutanceau, Jean-Pierre, 2006. Harmonia axyridis (Pallas, 1773): an introduced Asian ladybird, its acelimatation and extension in France. Bulletin de la Societe Entomologique de France. 111(3). SEP 2006. 395-401.
de Almeida, L. M., and V. B. da Silva. 2002. First record of Harmonia axyridis (Pallas) (Coleoptera, Coccinellidae): A lady beetle native to the Palaearctic region. Revista Brasileira de Zoologia. 19(3):941-944.
d Hondt, Jean-Loup, 2009. Entomologistophile coccinelle (Coleoptera Coccinellidae). Entomologiste (Paris). 65(1). JAN-FEB 2009. 25-26. Eschen, Rene; Babendreier, Dirk; Nauer, Stefanie; Bigler, Franz; Kenis, Marc, 2007. Surveys for ladybirds (Coleoptera : Coccinellidae) in Switzerland and confirmation of the presence of the invasive alien ladybird species, Harmonia axyridis (Pallas). Mitteilungen der Schweizerischen Entomologischen Gesellschaft. 80(1-2). 2007. 7-14. Fauske, G. M., P. P. Tinerella, and D. A. Rider. 2003. A list of the lady beetles (Coleoptera: Coccinellidae) of North Dakota with new records from North Dakota and Minnesota. Journal of the Kansas Entomological Society. 76(1):38-46. Fluegel, Hans-Joachim, 2008. The Asian Ladybird Harmonia axyridis Pallas, in the 1793 has also been observeed in Northern Hessen (Coleoptera: Coccinellidae). Philippia. 13(3). 2008. 217-222. Gagnepain, Jean-Claude, 2007. Presence of Harmonia axyridis (Pallas, 1773) in the Centre region (Coleoptera Coccinellidae) Entomologiste (Paris). 63(2). MAR-APR 2007. 91. Galvan, Tederson L.; Koch, Robert L.; Hutchison, William D., 2008. Impact of fruit feeding on overwintering survival of the multicolored Asian lady beetle, and the ability of this insect and paper wasps to injure wine grape berries. Entomologia Experimentalis et Applicata. 128(3). SEP 2008. 429-436. Graesser, L. 2003. Impostor ladybugs invade campus, actually beetles. Daily Illinois: Sept 26, 2003 edition. Hahn, Jeffrey; Kovach, Joseph, 2004. Multicolored Asian lady beetles in agriculture and urban environments. American Entomologist. 50(3). Autumn 2004. 152. Harmon, Jason P.; Stephens, Erin; Losey, John, 2007. The decline of native coccinellids (Coleoptera : Coccinellidae) in the United States and Canada. Journal of Insect Conservation. 11(1). MAR 2007. 85-94. Hautier, Louis; Gregoire, Jean-Claude; de Schauwers, Jerome; Martin, Gilles San; Callier, Pierre; Jansen, Jean-Pierre; de Biseau, Jean-Christophe, 2008. Intraguild predation by Harmonia axyridis on coccinellids revealed by exogenous alkaloid sequestration. Chemoecology. 18(3). SEP 2008. 191-196. Hesler, Louis S.; Kieckhefer, Robert W., 2008. Status of exotic and previously common native coccinellids (Coleoptera) in South Dakota landscapes. Journal of the Kansas Entomological Society. 81(1). APR 2008. 29-49. Hesler, L. S., R. W. Kieckhefer, and D. A. Beck. 2001. First record of Harmonia axyridis (Coleoptera: Coccinellidae) in South Dakota and notes on its activity there and in Minnesota. Entomological News. 112(4):264-270. Hesler, L. S., R. W. Kieckhefer, and M. A. Catangui. 2004. Surveys and field observations of Harmonia axyridis and other Coccinellidae (Coleoptera) in eastern and central South Dakota. Transactions of the American Entomological Society (Philadelphia). 130(1: 113-133. Huelsman, Margaret ; Kovach, Joe, 2004. Behavior and treatment of the multicolored Asian lady beetle (Harmonia axyridis) in the urban environment. American Entomologist. 50(3). Autumn 2004. 163-164. Iperti, G., and E. Bertand. 2001. Hibernation of Harmonia axyridis (Coleoptera: Coccinellidae) in South-Eastern France . Acta Societatis Zoologicae Bohemicae. 65(3):207-210. Jansen, Jean Pierre; Hautier, Louis, 2008. Ladybird population dynamics in potato: comparison of native species with an invasive species, Harmonia axyridis BioControl (Dordrecht). 53(1). FEB 2008. 223-233. Klausnitzer, B. 2002. Harmonia axyridis (PALLAS, 1773) in Germany (Col., Coccinellidae). Entomologische Nachrichten und Berichte. 46(3):177-183. Klausnitzer, Bernhard, 2004. Harmonia axyridis (Pallas, 1773) in Basel-Stadt (Coleoptera, Coccinellidae). Mitteilungen der Entomologischen Gesellschaft Basel. 54(3-4). 2004. 115-122. Klausnitzer, Ulrike, 2005. Harmonia axyridis (PALLAS, 1773) in Saxony (Col., Coccinellidae). Entomologische Nachrichten und Berichte. 49(1). 2005. 49. Knill-Jones, Sam, 2007. An invasion of the Harlequin Ladydird (Harmonia axyridis Pallas) (Col. Coccinellidae) in the South Wight. Entomologist s Record & Journal of Variation. 119(Part 2). MAR-APR 2007. 82. Koch, R. L.; Venette, R. C.; Hutchison, W. D., 2004. Nontarget effects of the multicolored Asian lady beetle (Coleoptera: Coccinellidae): Case study with the monarch butterfly (Lepidoptera: Nymphalidae). American Entomologist. 50(3). Autumn 2004. 155-156. Koch R. L, Venette R. C, Hutchison W. D., 2006. Invasions by Harmonia axyridis (Pallas) (Coleoptera: Coccinellidae) in the Western Hemisphere: implications for South America. Neotropical Entomology 35(4), 421-434. Koch, R. L.; Venette, R. C.; Hutchison, W. D., 2006. Predicted impact of an exotic generalist predator on monarch butterfly (Lepidoptera : Nymphalidae) populations: A quantitative risk assessment. Biological Invasions. 8(5). JUL 2006. 1179-1193. Koch, R. L., W. D. Hutchinson, R. C. Venette, and G. E. Heimpel. 2003. Susceptibility of immature monarch butterfly, Danaus plexippus (Lepidoptera: Nymphalidae: Danainae), to predation by Harmonia axyridis (Coleoptera: Coccinellidae). Biological Control. 28(2):265-270. Koch, Robert L.; Galvan, Tederson L., 2008. Bad side of a good beetle: the North American experience with Harmonia axyridis BioControl (Dordrecht). 53(1). FEB 2008. 23-35. Kontodimas, Dimitrios C.; Stathas, George J.; Martinou, Aggeliki F., 2008. The aphidophagous predator Harmonia axyridis (Coleoptera : Coccinellidae) in Greece, 1994-1999. European Journal of Entomology. 105(3). 2008. 541-544. Kovach, Joseph, 2004. Impact of multicolored Asian lady beetles as a pest of fruit and people. American Entomologist. 50(3). Autumn 2004. 159-161. Koyama, Satoshi; Majerus, Michael E. N., 2008. Interactions between the parasitoid wasp Dinocampus coccinellae and two species of coccinellid from Japan and Britain. BioControl (Dordrecht). 53(1). FEB 2008. 253-264. Krafsur, E. S., T. J. Kring, J. C. Miller, P. Nariboli, J. J. Obrycki, J. R. Ruberson, and P. W. Schaefer. 1997. Gene flow in the exotic colonizing ladybeetle Harmonia axyridis in North America. Biological-Control. 8(3): 207-214. Linder, C.; Lorenzini, F.; Kehrli, P., 2009. Potential impact of processed Harmonia axyridis on the taste of Chasselas and Pinot noir wines. Vitis. 48(2). 2009. 101-102. Lombaert, Eric; Malausa, Thibaut; Devred, Remi; Estoup, Arnaud, 2008. Phenotypic variation in invasive and biocontrol populations of the harlequin ladybird, Harmonia axyridis. BioControl (Dordrecht). 53(1). FEB 2008. 89-102. Loomans, Antoon, 2004. Colourful Asiatic ladybird (Harmonia axyridis (Pallas)) in Limburg? Natuurhistorisch Maandblad. 93(9). SEP 2004. 271. Lornmen, Suzanne T. E.; Cuppen, Jan G. M., 2007. Ladybird beetles: rulers of the fields? Entomologische Berichten (Amsterdam). 67(6). DEC 2007. 260-263. Lucas, Eric; Vincent, Charles; Labrie, Genevieve; Chouinard, Gerald; Fournier, Francois; Pelletier, Francine; Bostanian, Noubar J.; Coderre, Daniel; Mignault, Marie-Pierre; Lafontaine, Pierre, 2007. The multicolored Asian ladybeetle Harmonia axyridis (Coleoptera : Coccinellidae) in Quebec agroecosystems ten years after its arrival. European Journal of Entomology. 104(4). OCT 15 2007. 737-743. Mabbott, Paul, 2005. Report of the second London ladybird survey, 2003-2004, with notes on new species, especially Harmonia axyridis, the multivariate Asian ladybird. London Naturalist.(84). 2005. 161-165. Majerus, Michael; Holroyd, Oscar; Brown, Peter; Roy, Helen, 2008. The Harlequin Ladybird Harmonia axyridis (Col.: Coccinellidae) reaches Scotland. Entomologist s Record & Journal of Variation. 120(Part 1). JAN-FEB 2008. 42-43. Merkl Otto., 2008. First record of the harlequin ladybird (Harmonia axyridis Pallas) in Hungary (Coleoptera: Coccinellidae). N�v�nyv�delem 44(5), 239-242 (in Hungarian). Mizell, Russell F. III, 2007. Impact of Harmonia axyridis (Coleoptera : Coccinellidae) on native arthropod predators in pecan and crape myrtle. Florida Entomologist. 90(3). SEP 2007. 524-536. Musser, F. R., and A. M. Shelton. 2003. Factors altering the temporal and within-plant distribution of coccinellids in corn and their impact on potential intra-guild predation. Environmental-Entomology. 32(3): 575-583. Nakata, T. 1995. Population fluctuations of aphids and their natural enemies on potato in Hokkaido, Japan. Applied-Entomology-and-Zoology. 30(1): 129-138. Nakazawa, Takuya; Satinover, Shama M.; Naccara, Lisa; Goddard, Lucy; Dragulev, Bojan P.; Peters, Edward; Platts-Mills, Thomas A. E., 2007. Asian ladybugs (Harmonia axyridis): A new seasonal indoor allergen. Journal of Allergy & Clinical Immunology. 119(2). FEB 2007. 421-427. Nalepa, C. A.; Kennedy, G. G.; Brownie, C., 2004. Orientation of multicolored Asian lady beetles to buildings. American Entomologist. 50(3). Autumn 2004. 165-166. Nault, B. A., and G. G. Kennedy. 2003. Establishment of multicolored Asian lady beetle in Eastern North Carolina: Seasonal abundance and crop exploitation within an agricultural landscape. Biocontrol (Dordrecht). 48(4):363-378. Nimmo, Kayla R.; Tipping, Philip W., 2009. An Introduced Insect Biological Control Agent Preys on an Introduced Weed Control Biological Agent. Florida Entomologist. 92(1). MAR 2009. 179-180. Noia, Marlene; Borges, Isabel; Soares, Antonio Onofre., 2008. Intraguild predation between the aphidophagous ladybird beetles Harmonia axyridis and Coccinella undecimpunctata (Coleoptera : Coccinellidae): The role of intra and extraguild prey densities. Biological Control. 46(2). AUG 2008. 140-146. Potter, M. F., R. Bessin, and L. Townsend. 1998. Asian Lady Beetle Infestation of Structures. University of Kentucky Department of Entomology, Extension Entomologists. Przewozny M, Barozek T, Bunalski M., 2007. Harmonia axyridis (Pallas, 1773) (Coleoptera: Coccinellidae) new species of ladybird beetle for Polish fauna. Polskie Pismo Entomologiczne 76(3), 177-182 (abst.). Ribbands, Brian; Brown, Peter M. J.; Roy, Helen E.; Majerus, Michael E. N., 2009. The most Northern record of the Harlequin Ladybird (Col., Coccinellidae) in the British Isles. Entomologist s Monthly Magazine. 145(1736-8). JAN-MAR 2009. 43-44. Roy, H. E.; Baverstock, J.; Ware, R. L.; Clark, S. J.; Majerus, M. E. N.; Baverstock, K. E.; Pell, J. K., 2008. Intraguild predation of the aphid pathogenic fungus Pandora neoaphidis by the invasive coccinellid Harmonia axyridis. Ecological Entomology. 33(2). APR 2008. 175-182. Roy, Helen; Wajnberg, Eric., 2008. From biological control to invasion: the ladybird Harmonia axyridis as a model species. BioControl (Dordrecht). 53(1). FEB 2008. 1-4. Santi, F; Burgio, G., and Maini, S., 2003. Intra-guild predation and cannibalism of Harmonia axyridis and Adalia bipunctata in choice conditions. Bulletin of Insectology. 56(2). 207-21. Sato, S. and Dixon, A.F.G., 2004. Effect of intraguild predation on the survival and development of three species of aphidophagous ladybirds : consequences for invasive species. Agricultural and Forest Entomology 6 : 21-24. Sato, Satoru; Shinya, Katsuhiro; Yasuda, Hironori; Kindlmann, Pavel; Dixon, Anthony F. G., 2009. Effects of intra and interspecific interactions on the survival of two predatory ladybirds (Coleoptera: Coccinellidae) in relation to prey abundance. Applied Entomology & Zoology. 44(2). MAY 2009. 215-221. Sato, Satoru; Yasuda, Hironori; Evans, Edward W.; Dixon, Anthony F. G., 2009. Vulnerability of larvae of two species of aphidophagous ladybirds, Adalia bipunctata Linnaeus and Harmonia axyridis Pallas, to cannibalism and intraguild predation. Entomological Science. 12(2). JUN 2009. 111-115. Sebolt, D. C., and D. A. Landis. 2004. Arthropod predators of Galerucella calmariensis L. (Coleoptera: Chrysomelidae): An assessment of biotic interference. Environmental Entomology. 33(2): 356-361. Sloggett, J. J.; Davis, A. J., 2010. Eating chemically defended prey: alkaloid metabolism in an invasive ladybird predator of other ladybirds (Coleoptera: Coccinellidae) Journal of Experimental Biology. 213(2). JAN 15 2010. 237-241. Snyder, W. E., G. M. Clevenger, and S. D. Eigenbrode. 2004. 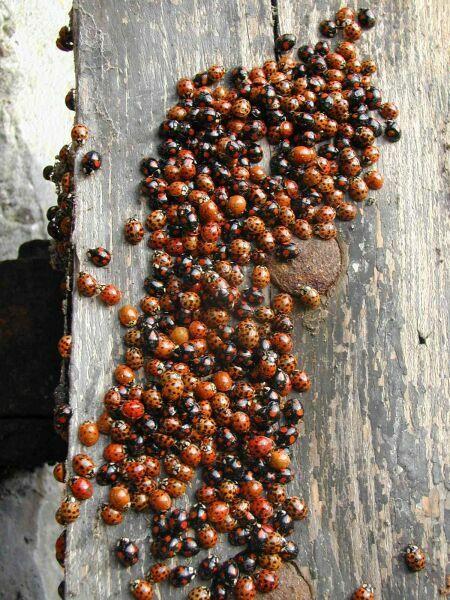 Intraguild predation and successful invasion by introduced ladybird beetles. Oecologia. 140(4):559-565. Stals, Riaan; Prinsloo, Goddy, 2007. Discovery of an alien invasive, predatory insect in South Africa: the multicoloured Asian ladybird beetle, Harmonia axyridis (Pallas) (Coleoptera : Coccinellidae) South African Journal of Science. 103(3-4). MAR-APR 2007. 123-126. Staverlokk, Arnstein; Saethre, May-Guri; Hagvar, Eline B., 2007. A review of the biology of the invasive harlequin ladybird Harmonia axyridis (Pallas, 1773) (Coleoptera, Coccinellidae) Norwegian Journal of Entomology. 54(2). 2007. 97-104. Tedders, W. L., and P. W. Schaefer. 1994. Release and establishment of Harmonia axyridis (Coleoptera: Coccinellidae) in the southeastern United States. Entomological-News. 105(4): 228-243. Thalji R, Stojanovic D., 2008. First sighting of the invasive ladybird Harmonia axyridis Pallas (Coleoptera, Coccinellidae) in Serbia. Biljni Lekar 36(6), 389-393 (abst.). The National Biodiversity Data Centre, 2011. Harlequin ladybird established in the wild in Ireland. Tolasch, T. 2002. Harmonia axyridis (Col., Coccinellidae) is rapidly spreading throughout Hamburg: Origin for a colonisation of middle Europe? Entomologische Nachrichten und Berichte. 46(3):185-188. Tourniaire, R., A. Ferran, L. Giuge, C. Piotte, and J. Gamier. 2000. 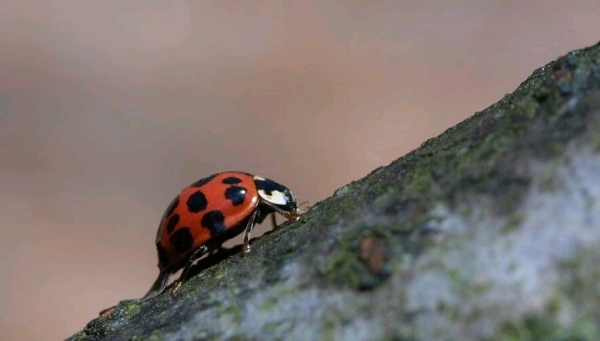 A natural flightless mutation in the ladybird, Harmonia axyridis. Entomologia-Experimentalis-et-Applicata. 96(1): 33-38. Uliana, Marco, 2008. New records of Harmonia axyridis (Pallas, 1773) in northern Italy (Coleoptera, Coccinellidae). Bollettino del Museo Civico di Storia Naturale di Venezia. 59 2008. 51-53. Viktor, Marko; Gabor, Pozsgal, 2009. Spread of Harlequin Beetle (Harmonia axyridis Pallas, 1773) Coleopters Coccinellidae in Hungary, and the first records from Romania and Ukraine. Novenyvdelem. 45(9). SEP 2009. 481-490. Wang Su; Zhang Run-zhi; Zhang Fan., 2007. Research progress on biology and ecology of Harmonia axyridis Pallas (Coleoptera : Coccinellidae) Yingyong Shengtai Xuebao. 18(9). SEP 2007. 2117-2126. Wang Xiaoyi; Shen Zuorui; Xu Wenbing; Lu Jian, 2003. Sublethal effects of insecticides on fecundity of multicolored Asian ladybird Harmonia axyridis. Yingyong Shengtai Xuebao. 14(8). August 2003. 1354-1358. Ware, Remy Lian; Ramon-Portugal, Felipe; Magro, Alexandra; Ducamp, Christine; Hemptinne, Jean-Louis; Majerus, Michael E. N., 2008. Chemical protection of Calvia quatuordecimguttata eggs against intraguild predation by the invasive ladybird Harmonia axyridis BioControl (Dordrecht). 53(1). FEB 2008. 189-200. Ware, Remy L.; Majerus, Michael E. N., 2008. Intraguild predation of immature stages of British and Japanese coccinellids by the invasive ladybird Harmonia axyridis BioControl (Dordrecht). 53(1). FEB 2008. 169-188. Ware, Remy L.; Yguel, Benjamin; Majerus, Michael E. N., 2008. Effects of larval diet on female reproductive output of the European coccinellid Adalia bipunctata and the invasive species Harmonia axyridis (Coleoptera : Coccinellidae) European Journal of Entomology. 105(3). 2008. 437-443. Ware, Remy; Yguel, Benjamin; Majerus, Michael, 2009. 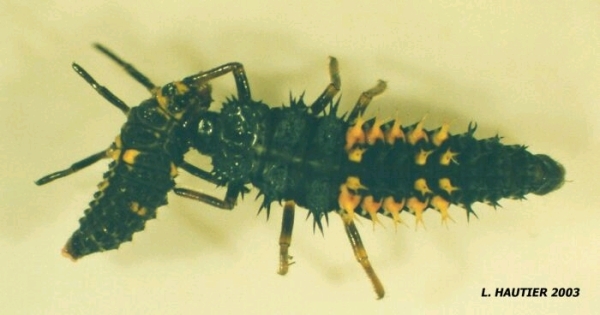 Effects of competition, cannibalism and intra-guild predation on larval development of the European coccinellid Adalia bipunctata and the invasive species Harmonia axyridis. Ecological Entomology. 34(1). FEB 2009. 12-19. Weihrauch, Florian., 2008. Surprise attack: The capture of hop garden of the Hallertau through Harmonia axyridis in the year 2007 (Coleoptera : Coccinellidae). Nachrichtenblatt der Bayerischen Entomologen. 57(1-2). FEB 15 2008. 12-16. General research interests are in risk assessment of invasive species and integrated pest management. In particular, his research has focused on assessing risk of the exotic lady beetle, Harmonia axyridis, having negative impacts on monarch populations developing in agricultural systems.